On Tuesday February 23, 2016. Grant Carrington came to Burney, California to visit. 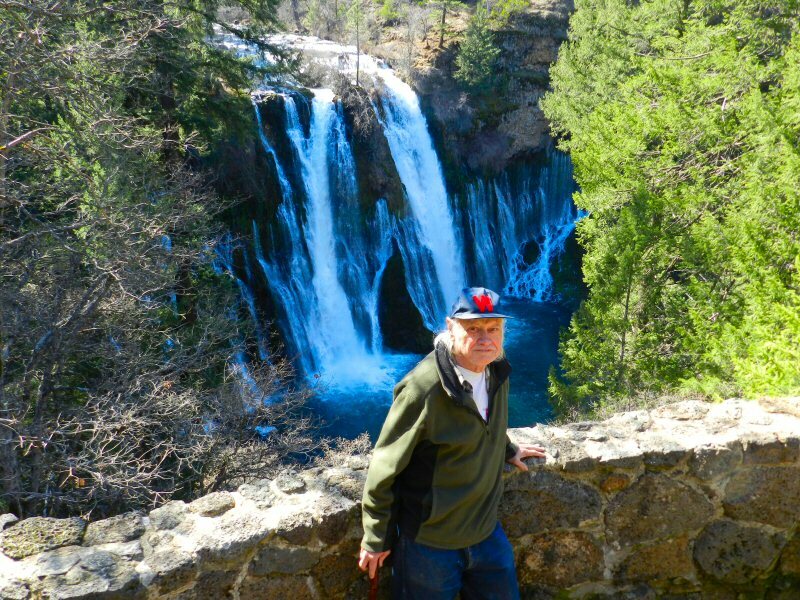 Two days later, my wife Linda and I took Grant to Burney Falls. I met Grant around the turn of the century at the Year of the Rabbit Coffee shop in Bowie Maryland when we both used to play the open mic there. It was a wonderful venue and we became friends. We sometimes met at other open mics such as the Wagonshed in New Freedom Pennsylvania. Here’s me playing at Wagonshed. Since then, Linda and I have settled here in Burney. Grant retired from his government job and moved to Massachusetts. We have stayed in touch. About five months ago, Grant decided to travel around the country. He vacated his apartment in Massachusetts and started driving around the country visiting friends and playing at open mics. When Grant arrived he had been on the road for five months. Apparently he brings sunshine with him wherever he goes. Traveling down the East Coast, through the South, around the Southwest and California, he only experienced five rainy days. In Arizona, he visited another of our friends from the Year of the Rabbit, JR Robusto. On Christmas Day he was at the Grand Canyon. The week before coming to Burney he was in Berkeley and San Francisco. 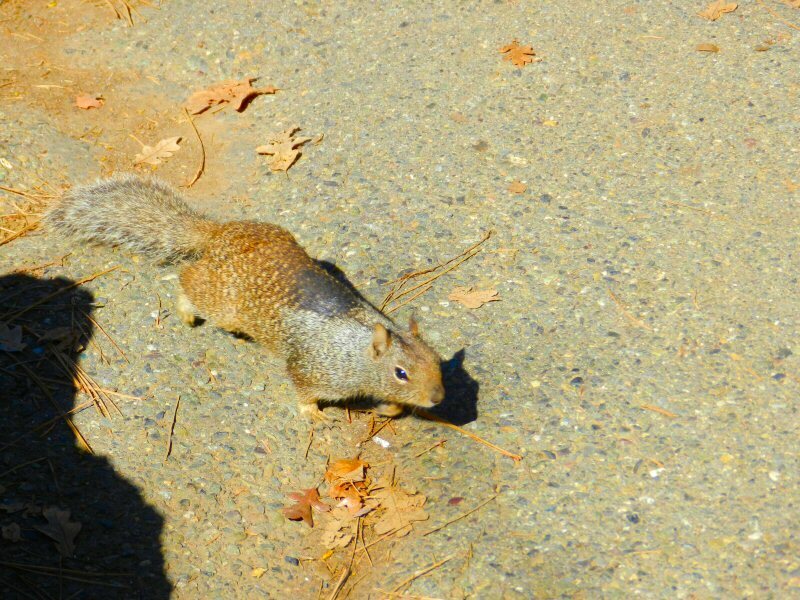 On his way here, he stopped in Muir Woods. 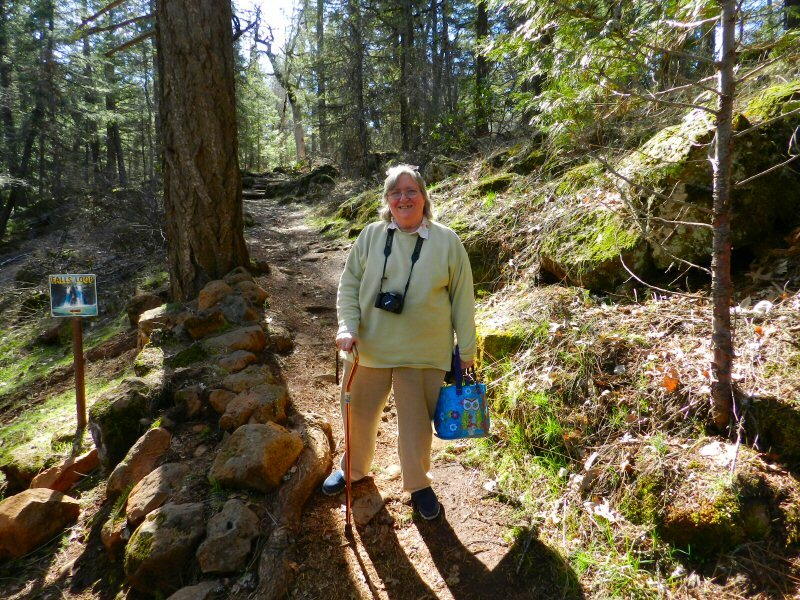 At 77 years of age, Grant is an avid hiker and lover of nature. 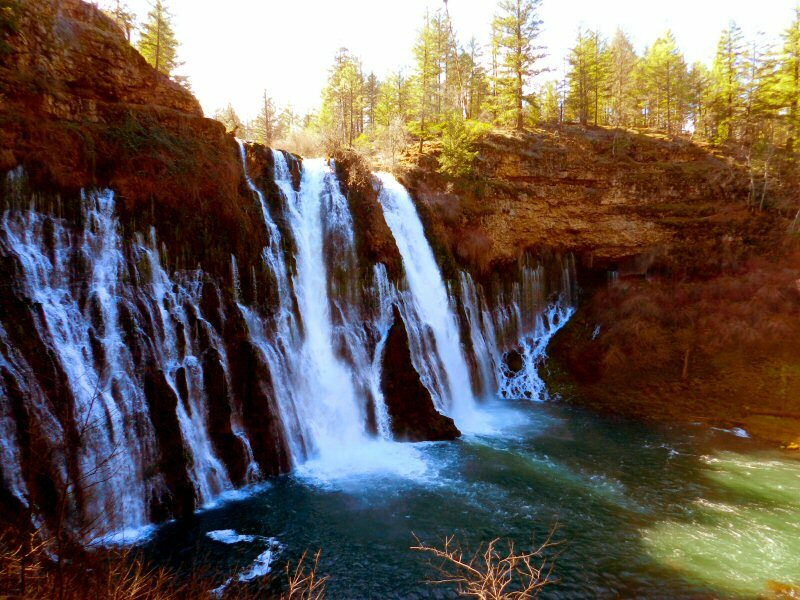 Linda and I thought Grant might enjoy Burney Falls. We entered the park from Clark’s Creek Road. It was a beautiful, Spring-like February day. 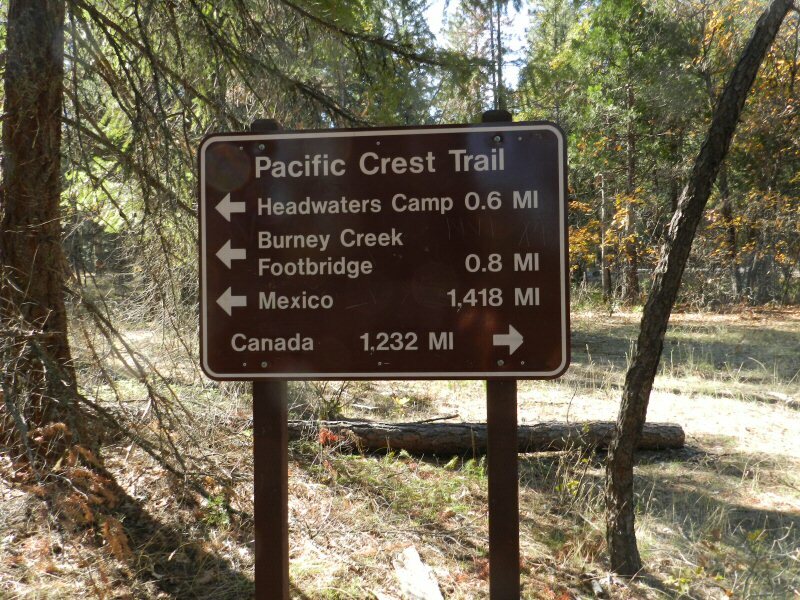 Grant has hiked portions of the Appalachian Trail, but had never hiked the Pacific Crest Trail. When we came to the PCT sign I had him take a few steps and told him that now he could say that he had hiked on the PCT. Linda went one direction on the loop to take photos. 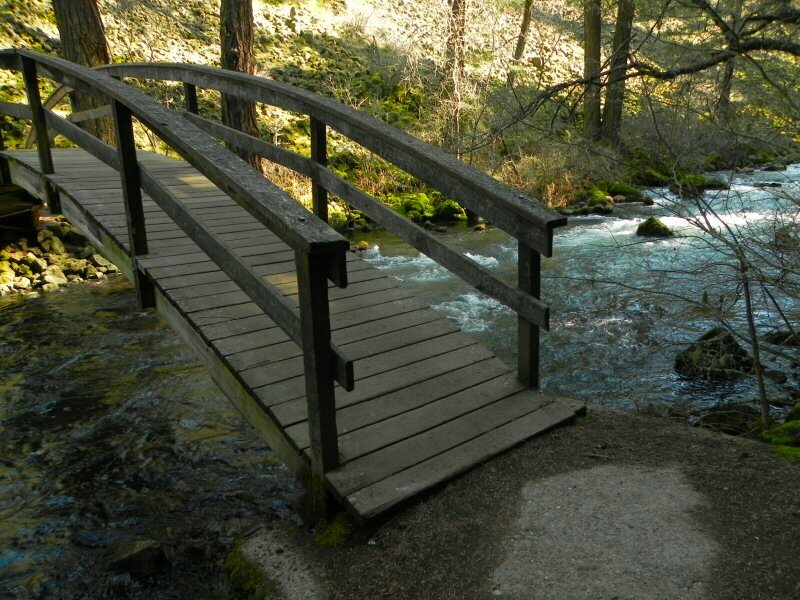 Grant and I headed down to the bridge over Burney Creek. 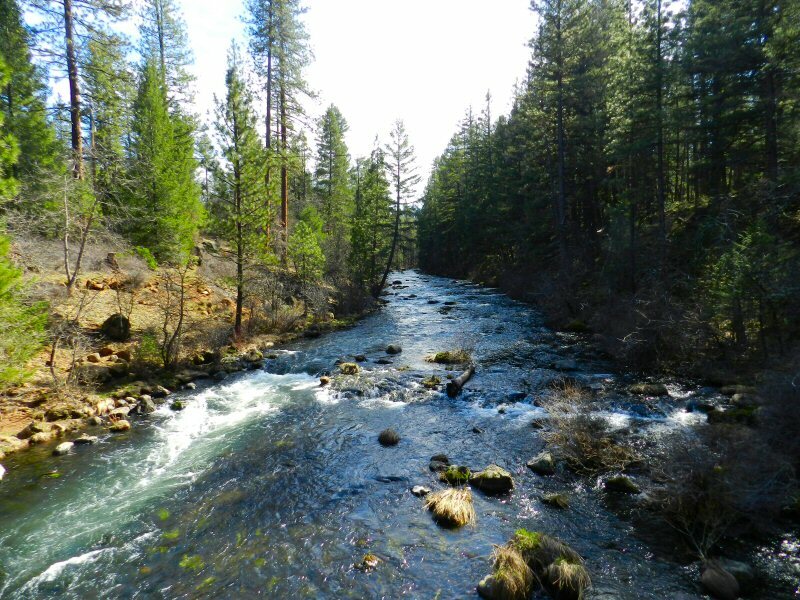 We got a few pictures of the creek and I showed Grant where my cousin Ray had carved his initials into the wood railing when we had hiked the trail 46 years ago. Then we hiked up toward the main entrance and the visitor’s center. As we went we caught several views of the falls through the woods. The amenities were closed so we headed down to the falls overlook. 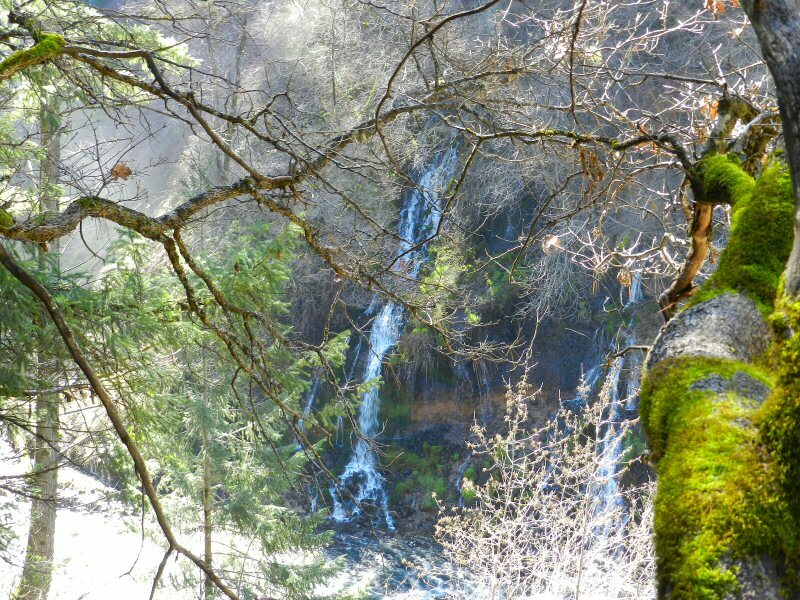 As we paused going down the hatchback trail at one of several places where we stopped to take in the falls, Grant smiled and said, “Well, you certainly do have a well-kept secret here.” Grant had never heard of our precious local treasure. One of the things that Grant enjoyed was the small falls emerging from the wall of the canyon. 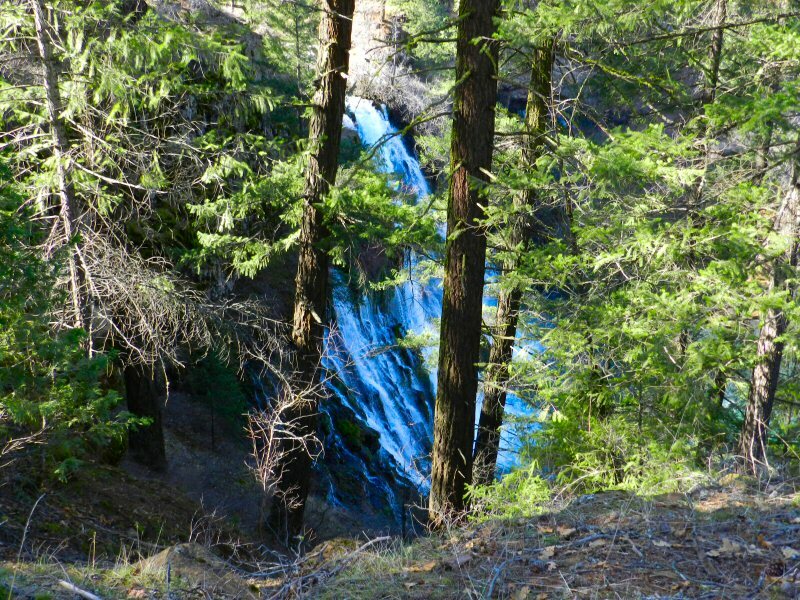 After enjoying the falls from the base, we hiked downtrail along Burney Creek marveling at the old-growth Douglas fir. As we approached the lower bridge, we met Linda. Linda wanted to continue on to the Falls and then hike back with us so Grant I sat for a spell on the bench by the bridge. As well as being a singer songwriter, Grant also writes science fiction. He also is a bit of a philosopher. During his 3-day stay we had numerous interesting conversations. We enjoyed chatting while we waited for Linda. After she arrived we proceeded up the hill. Grant’s was commenting on the lichens, the reeds, and the various interesting colors that were beginning to emerge. 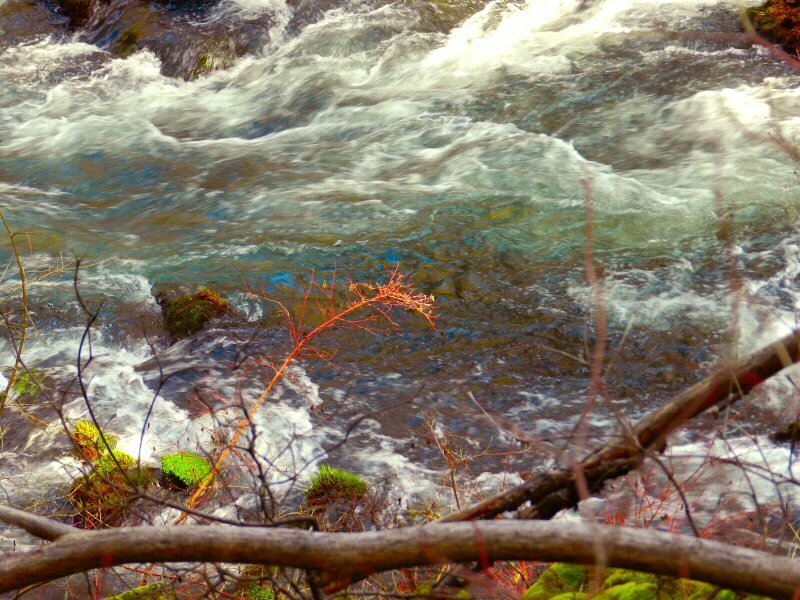 This small red orange shoot over the creek aroused his interest. Proceeding on, we came to another view of the falls from this side of the creek. Linda, Grant, and I made our way back to the car. We had to be home by 3 p.m. because some ladies from the Word of Life Assembly of God were stopping by to deliver some cookies. We didn’t want to miss that! 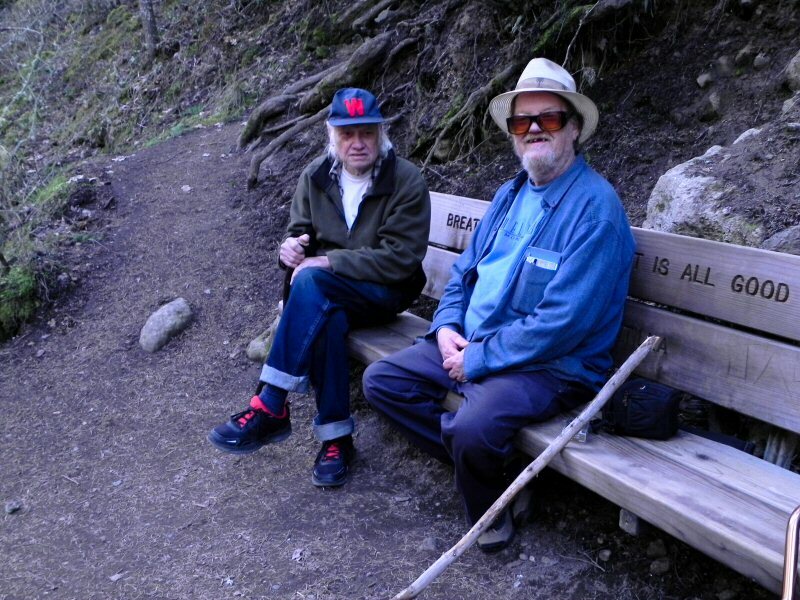 When we had arrived at the park I realized that I had forgotten to bring my walking stick. Fortunately, I happened upon a nice small branch on our hike. Filing off a few nobs at the top where I wanted to put my hand, I had made use of this fine staff. As we exited the park we met a group from McCloud entering the park. I asked if any of them would like my walking stick and one nice lady gratefully received it. There weren’t a lot of hikers on the trail on this lovely February day. However, in addition to these merry McClouders we did also meet a nice family from Ashland and a young Irish trio from Placerville. 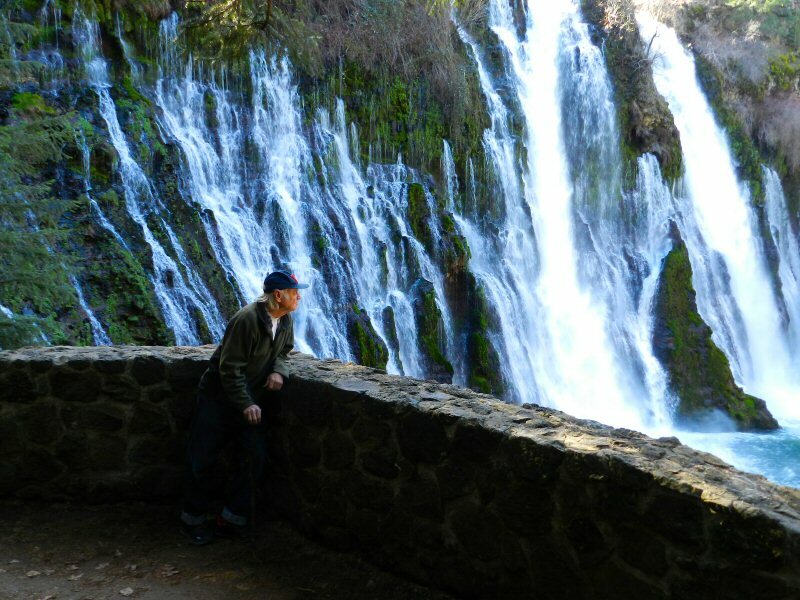 Meeting and chatting with visitors from other places is one of the things I love about hiking the Burney Falls Loop. 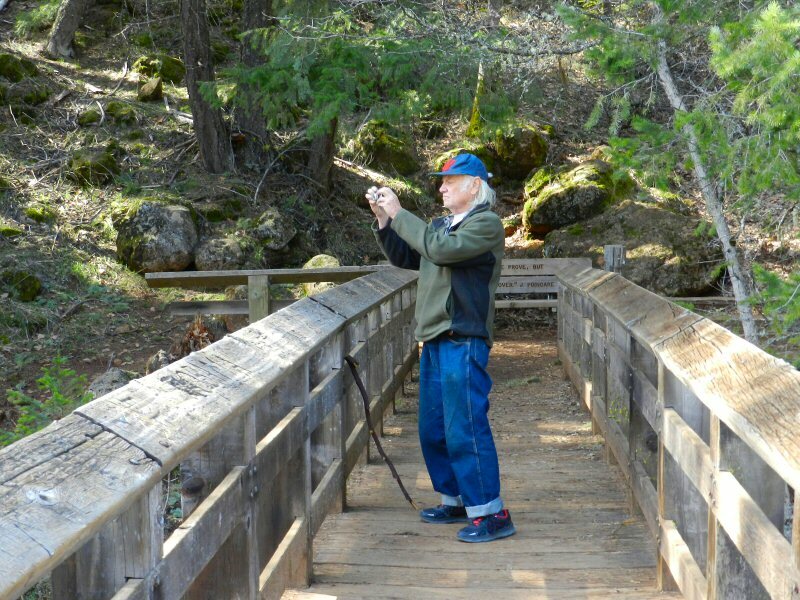 I think Grant enjoyed his visit to Burney and our park. He treated Linda and me to a wonderful steak dinner at Pit River Casino. 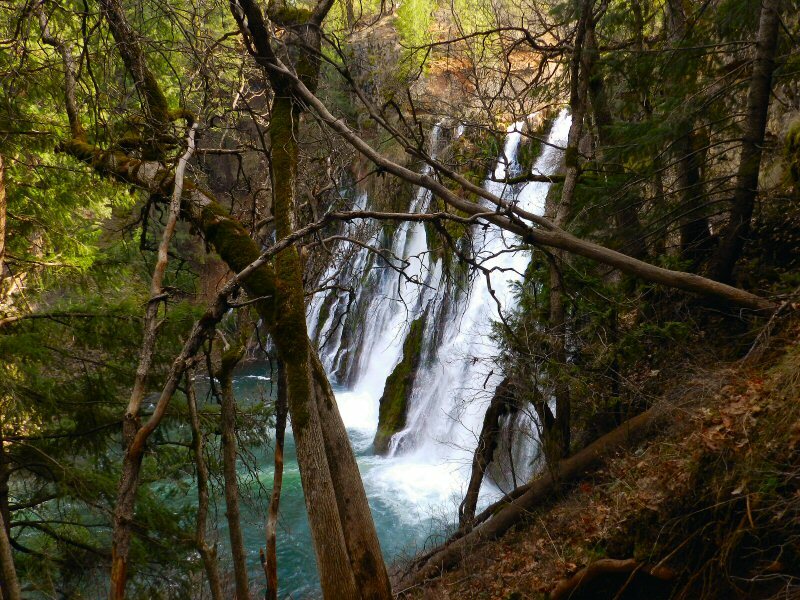 I hope Burney and Burney Falls make their way into one of his songs or books.